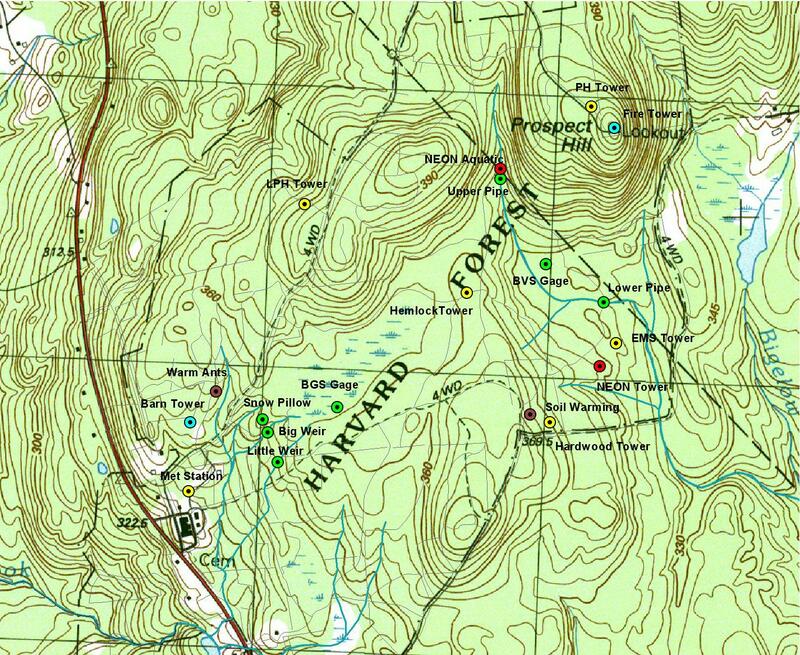 The Harvard Forest Field Wireless Network (HFFW) provides high-speed Internet access to field sites at the Harvard Forest. The HFFW enables scientists to monitor and control their equipment at long-term study sites and to collect and process data in real time. It also enables researchers and students to design and implement short-term experiments that can be accessed remotely, effectively creating an outdoor laboratory and classroom for environmental science. The HFFW was designed through a partnership between Harvard Forest, Harvard University Network Operations, and Silvian Technology Services. It became operational in 2010 with funding from the National Science Foundation and Harvard University. Implemented as an extension of the Harvard University network, the HFFW is jointly administered by the Forest and Harvard Network Operations. In its current form the HFFW connects to major research sites in the Prospect Hill Tract (see map), including three eddy flux towers and two global warming experiments. Users in the vicinity of these sites have direct access to the Internet via wired or wireless connections. Authenticated users who are offsite can access their equipment remotely over the network. Examples of (near) real-time datasets include our weather station & stream gages and phenology webcams. The HFFW is designed to support future expansion as the use of sensor and wireless technologies grows and as additional funding becomes available.